Anti-bullying programs might not work as well for popular bullies like Donald Trump. Anti-bullying efforts need to address the stubborn problem of popular bullies. 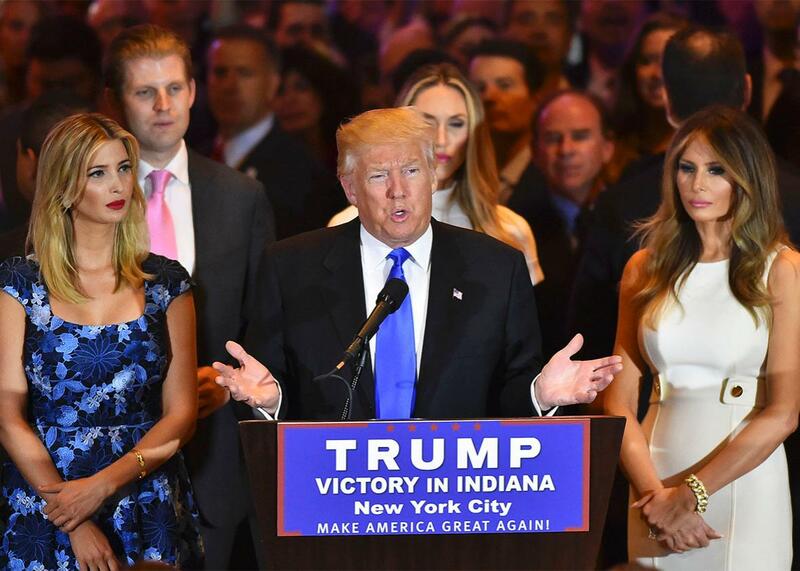 Surrounded by his supporters and family, Donald Trump addresses the media at Trump Tower in Manhattan following primary election results on May 3. In the movie Mean Girls, wide-eyed protagonist Cady Heron is horrified when she learns the three popular girls she has befriended have created a “Burn Book” filled with pasted pictures of their classmates alongside disparaging comments marked in the margins. No one is safe from the bullying of the film’s high-status high-schoolers. Unfortunately, real-world statistics bear this awful fact out: Numbers out this week from a U.S. National Academies of Sciences, Engineering, and Medicines report indicate that between 18 percent to 31 percent of children and teens are bullied in school. And bullying is not just a problem among children: Adults can be perpetrators and victims as well, as this year’s presidential election proves. Earlier this month, Elizabeth Warren labeled Donald Trump a bully when he called her “goofy” and a “fraud” in reference to the question of her Native American heritage. It was not the first time the Democratic senator from Massachusetts had described him as such, nor is she the only one to do so. Why do some of the most popular people in schools and most prominent public figures use their power to repeatedly put others down? The answer is hinted at in various scenes in Mean Girls. When Cady is taunted by Regina George, “queen bee” of the popular clique, in one cafeteria scene, she compares the structured social hierarchy of her high school to that of the animals her zoologist parents studied: “I knew how this would be settled in the animal world,” Cady thinks to herself in a voice-over, imagining herself leaping over the lunch table and lunging at the girl, “but in Girl World, all the fighting had to be invisible.” Bullying, in the mind of Cady, is a primal social instinct. Academic researchers, for their part, recognize that bullying is a way of gaining and preserving power—popular bullies are likely trying maintain their status. Early data hint that it might be more difficult to get popular perpetrators to stop bullying, perhaps—though it is not proven—because of the social status gained through this behavior. Through this lens, it’s slightly easier to make sense of Trump’s persistent bullying: His popularity, at least within his party, has been confirmed as he’s scooped up wins in primary elections during the past several months. If anti-bullying programs are to become more effective, they need a specific way of overcoming the particular problem of popular bullies. The new 296-page National Academies’ report laments the lack of consistency among definitions of bullying, but the most common way to define the behavior seems to be as repeated intentional and aggressive actions in which the perpetrator has greater power—regardless of whether that power imbalance is real or simply perceived. Ultimately, bullying might not only be a symptom of a power imbalance but also a contributing factor. According to the report, even though some individuals who bully are “maladjusted,” others, it says, “are motivated by establishing their status within their peer group.” It’s worth noting that studies have found that bullies tend to be more popular than their peers. There’s evidence that aggression—a component of bullying—is linked to a student’s perceived popularity. Further research has suggested that bullies are calculating and often target peers who are less likely to be defended by significant others. Additionally, unpublished research from the group of sociologist René Veenstra, who is based at the University of Groningen in the Netherlands, suggests that popular bullies will switch from targeting one victim to another as a way to maintain their status. “Popular bullies are very, very strategic and they seek new targets all the time,” he says. So what stops a popular bully? That’s something researchers, educators, parents, and probably one particular presumed Democratic nominee would like to know. The answer is still being determined, and data from Finland suggest it might not be easy. Given the link between bullying and high status in the schoolyard social hierarchy, Finnish researchers set out to find out whether a widespread anti-bullying program, used in 90 percent of the schools in that country, was less effective in reforming popular bullies. The program, known as KiVa, is an abbreviation of kiusaamista vastaan, which translates to “against bullying” (the word kiva itself means nice in Finnish), and it uses tools such as video games to educate all students in a class about bullying and to emphasize, among other things, the role that bystanders can have in stopping bullying. The study surveyed almost 8,000 students in third through fifth grade and tracked 911 students determined to be bullies through the classroom questionnaires. About half of the 77 schools involved in the study implemented the KiVa program and half did not. After a year of the program, the bully behaviors of the low- and medium-popularity bullies had declined in schools using the KiVa program, as measured by how many of their peers nominated them as bullies. But according to the paper, published in 2014, there was no significant effect seen among the popular bullies, leading the researchers to suggest that this high-status group was less responsive to the intervention. One limitation of the 2014 study is that since the bully behavior was measured by peer surveys, it’s possible popular kids suffer because their reputation as bullies simply sticks more than those of other students who are less socially visible. And measures of a program’s “effectiveness” can be complicated because its mission is twofold: to try to reduce both bullying and victimization. It’s worth noting that a more recent study of the same Finnish schools found that the most severely victimized students benefited from the KiVa anti-bullying program, which has now been implemented in countries ranging from the U.S. to New Zealand. But there’s still a need for more evidence about which anti-bullying interventions work best, particularly as the National Academies report highlights that some anti-bullying programs actually seem to do more harm than good (retaliation that results from interventions can be a problem). The KiVa researchers suggest that one possible way forward is to try to teach students how to maintain high popularity status without resorting to bullying. Volk is trying just that. He has collaborated with Bruce Ellis, a University of Arizona professor of family studies and human development, and others on a new anti-bullying intervention called Meaningful Roles that tries assigning students tasks in the school day that help them feel high status without putting others down. Whereas some students in a class receive tasks such as feeding the classroom pet or watering the plants, those who were prone to bullying their peers received assignments to be greeters, a high-profile duty of welcoming students, families, and visitors at the entrance to the classroom. This, Volk, says, may have satisfied their need for social prominence while keeping them too busy to bully other students. The pilot program, which took place in a junior high school, did not collect individual-level data in its first year, but it did find that detentions decreased over the course of the study, as did trips to the nurses office for injuries or illness. The difficulty of untangling popularity from bullying is also evident in the political sphere, according to researchers. “There are so many parallels between the popularity of Trump and the school issues,” says Jaana Juvonen, a developmental psychologist at UCLA and one of the authors of the paper showing KiVa’s benefit for the most victimized students. She calls Trump a “classic” bully and has also noted that he has not been met with a unified front against his bullying. But even as the cries of bully crescendo, Trump may be losing his ability to be a popular bully. For one thing, his popularity relative to his main political rival or rivals may become diminished in the shift from the primary to general election. And in the eyes of some, such as Stanley Renshon, a psychoanalyst and political scientist at the City University of New York Graduate Center, Trump’s current attacks on his political peers don’t really qualify as bullying in part because these experts do not see an asymmetry of power. Whether or not it is possible to reform Trump’s behavior is not exactly a question for social scientists—they can’t quite make him the classroom’s greeter any time soon. If he does win the presidency, perhaps there’s hope the responsibilities and dignity of the office will keep him from deploying bullying tactics. But in the meantime, we are standing by as he creates something akin to the greatest political Burn Book to date.